In Calendar v. Stonebridge Gardens Section III Condominium Association, the Fourth District Court of Appeal concluded that the association was not required to actually file a lien in order to be entitled to priority over the unit owner in the distribution of surplus funds generated by the tax sale of her residence. In upholding the trial court’s order that surplus funds from the tax sale of the owner’s residence be disbursed to the association based on its claim for unpaid assessments, the Fourth DCA found that Section 718.116 of the Florida Statutes implies that a claim of lien against a unit owner for assessments becomes necessary only in cases in which a mortgagee is also asserting a claim. Therefore, recording a claim of lien is not an absolute prerequisite to the enforcement of a lien for unpaid assessments. 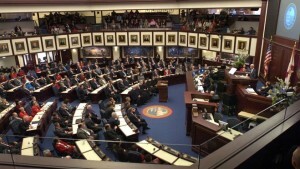 After several years of failed attempts, the estoppel bill has become law in Florida and mandates major changes to the way community associations in the state prepare estoppel letters (also called estoppel certificates), which are legal documents detailing the amounts owed by a unit owner prior to the sale of their residence. Reduces the time associations have to respond to written or electronic requests for estoppel certificates from 15 days to 10 business days. Requires each association to provide on its website the identity of a person or entity (and their street or e-mail address) to which requests for estoppel certificates may be sent. Provides that estoppel certificates must be submitted by hand delivery, regular mail, or e-mail to the requestor on the date of issuance of the certificate. The latest ruling reaffirming this holding came in late May from the Third District Court of Appeal in the case of Beacon Hill HOA v. Colfin Ah-Florida 7. The association appealed the final summary judgment in favor of Colfin, which had acquired a unit in the community via foreclosure sale, finding that the company was not liable for any amounts owed by the previous owners of the property due to the language in the association’s recorded declaration. Florida community associations are always seeking to implement the most cost-effective options at their disposal to collect unpaid dues and compel unit owners/residents to comply with their rules and restrictions. C ondominium associations used to have very few practical remedies at their disposal to address delinquencies and violations. They could file lawsuits or arbitration actions, but the costs of pursuing these cases can be a significant expense, and the imposition of fines requires the use of a fining committee and can be difficult to collect. Each year, our elected state representatives and senators meet in Tallahassee for a legislative session where they review and debate an extensive amount of proposed bills, only to send a few of those bills to the governor to be signed into law. For the third year in a row, our elected lawmakers will be discussing a bill that has once again resurfaced, and if passed, may have a significant impact on community associations’ wallets. House Bill 483 — also known as Senate Bill 398 or “the home tax” bill — proposes to place a considerable amount of requirements relating to the issuance of estoppel certificates on the condominium, cooperative or homeowners association responsible for preparing them. If signed into law, community associations will need to be both financially and operationally prepared to abide by the stringent changes set forth in the bill. An estoppel is a legally binding document prepared by a community association or its agent that discloses any liens, overdue assessments or any other money owed to the association, such as late fees and attorney’s fees. Estoppels are required by title companies in standard real estate transactions in order to inform the seller and buyer of any outstanding financial obligation(s) on the unit or parcel. If prepared incorrectly, the community association could be liable for miscalculated or incomplete balances, resulting in a loss for the association. Contrary to some people’s beliefs, estoppels aren’t generated by the push of a button. They take time and precision to prepare, which is why a bill that shifts even more of the burden on the association could be detrimental. One of the main components of this proposed bill is to mandate more rigorous deadlines for the preparation of estoppels. Currently, associations have 15 days to prepare and deliver an estoppel once it is requested. The bill would shorten this period to 10 business-days, which could be difficult for associations of varying sizes and levels of sophistication, as some will be anchored by antiquated bookkeeping or a lack of resources. When the Condominium Act was amended several years ago to allow associations to demand and collect rent directly from the tenants of unit owners who were delinquent in the payment of their monthly fees, community associations thought it was an answer to their prayers. Associations were struggling to recover from the foreclosure crisis, and many homeowners made the decision to rent their units to make some money but, unfortunately, they also chose not to pay their associations. However, utilization of this amendment has proven to be difficult and sometimes costly to enforce in cases in which de facto tenants and their landlords are able to demonstrate to the court that a tenancy under the letter of the law is not actually in place. How many times have we heard that the tenant is “family,” that the tenant does not pay the landlord, and that there’s no lease in place? A noteworthy example is found in a ruling last year by the Miami-Dade County Circuit Court Appellate Division in the case of Cecil Tavares v. Villa Doral Master Association. 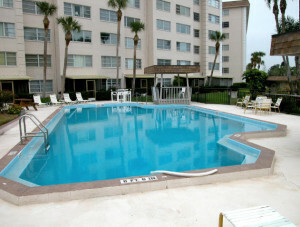 Tavares had conveyed his condominium unit via quit claim deed to a new owner, but he and his wife continued to live there. When the new owner went into arrears with the association, it attempted to collect the rent directly from Tavares and eventually filed for an eviction. The county court granted default judgment in favor of the association and issued a writ of possession to enable it to move forward with the eviction, but Tavares appealed on the question of whether the court erred by defining him as a tenant based on the quit claim deed. In Brittany’s Place Condominium Association v. U.S. Bank, the Second District Court of Appeal settled some lingering questions as to whether a lender or servicer that takes title to a residence via a mortgage foreclosure must also be the current owner of the first mortgage when the final judgment of foreclosure is issued. The case stems from a 2009 mortgage foreclosure action filed by U.S. Bank against the unit owner and all interested parties, including the association. The bank alleged that it was both the holder and servicer of the note and mortgage, acting on behalf of and with the authority of the owner. It was in possession of the note endorsed in blank, but the Federal Home Loan Mortgage Corp., better known as Freddie Mac, owned the note and mortgage. After securing a final judgment of foreclosure and acquiring title to the property via the foreclosure sale, U.S. Bank requested an estoppel letter from the association to determine the amount of past-due assessments. The parties could not agree on the extent of the lender’s liability, and the association eventually filed a lien foreclosure complaint against the lender, which then filed a counterclaim to seek compliance with the safe harbor caps. The trial court found that there were no genuine issues of material fact and U.S. Bank met the statutory requirements entitling it to the limited liability provisions provided by the safe harbor caps, so the court granted the bank’s motion for summary judgment. In the subsequent appeal, the association contended that U.S. Bank did not satisfy the safe harbor statute, which requires the entity acquiring title to have also been the first mortgagee or its successor or assignee. The association interpreted “first mortgagee or its successor or assignees” as necessitating ownership of the loan. In 2010, at the height of the recent foreclosure crisis, community associations in Florida gained an effective tool to aid them in their efforts to collect upon delinquent assessments. 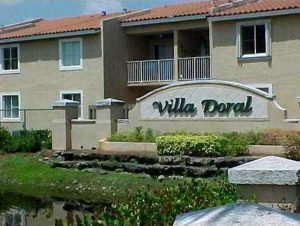 It was at that time that the legislature amended Florida law to authorize community associations to suspend the rights of unit owners and their tenants to use portions of the community’s common elements and amenities if the owner became delinquent by more than 90 days in their obligation to pay association monetary obligations, including assessments. Currently, the law also extends the association’s right to suspend such use rights in the event that the owner or their tenants should fail to comply with the association’s governing documents or rules. Prior to then, associations had few practical remedies at their disposal to address violations of rules. For instance, associations had the options of filing costly and lengthy lawsuits or arbitration actions, or imposing nominal fines. As for collection of delinquent assessments, associations’ options were limited to placing liens on the homes or units owned by delinquent owners – a remedy with limited effectiveness during the foreclosure crisis due to the statutory safe harbor protections benefiting lenders in Florida. However, since its implementation, some associations have found that suspending owner and tenants’ rights to use common elements or facilities may be an effective measure for contending with delinquencies as well as violations of rules and other restrictions. Two years ago a ruling by the state’s Second District Court of Appeal created a major wrinkle in the acceptance of partial payments by condominium associations when the payments had been endorsed and presented as full and complete remittances of the total outstanding debt owed by unit owners. The court’s ruling in the case of St. Croix Lane Trust v. St. Croix at Pelican Marsh Condominium Association essentially made it necessary for associations to consult with legal counsel when they received checks for partial payments that were in any way endorsed as representing the full and final payment of assessments owed by an owner. Prior to this ruling, associations were guided by a 2008 ruling by the Third District Court of Appeal which held that associations cannot refuse partial payments of assessments made by or on behalf of owners. In St. Croix, the unit owner’s attorney specifically wrote to the association attorney stating that the payment made by the owner in the amount of $840 was to be considered as the full and complete payment for the settlement of the account, which the association claimed was delinquent in excess of $38,000. 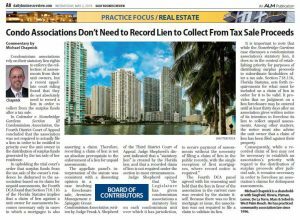 While the Naples association responded to the owner’s attorney by denying that the partial payment was the full and final payment of the amount owed, it accepted and deposited the check, applying the funds as a partial payment in accordance with Florida law. The appellate court found that the association’s depositing of the check containing the restrictive endorsement operated as an “accord and satisfaction,” resulting in a waiver of the association’s right to collect the remaining debt owed by the unit owner.